Government programs are notoriously wasteful, but currently our nation is divided between left wingers who want absolutely no cuts to government spending, and conservatives who want to abruptly pull the rug out from underneath the most vulnerable people in our society rather than targeting corporate welfare, immoral wars, wasteful military spending, and big government bureaucracy. The Libertarian Party will work to oppose wasteful spending and reduce the tax burden on regular individuals so they can spend their money how they choose and support local business, or save to look after their long term future. It is exceedingly difficult to start a business or employ anyone in Scotland. This halts job creation and harms the poor. The idea that we can create long term prosperity by simply moving money around the economy rather than by creating wealth is like believing that we can create more water by moving it from the deep end of a swimming pool to the shallow end – spilling half of it along the way. To really boost the economy we need to give people opportunities to create goods and services that actually increase our standard of living. That’s why the Libertarian Party wants to make it easy for people to create jobs in this country to improve the living standards of everyone on all rungs of the ladder. Government should be answerable to The People, not the reverse. Our party believes it is the duty of government to protect your life, person, property and civil liberties – not to snoop on you, regulate your personal habits, or lock people away for victimless crimes at great expense to the taxpayer. We are committed to rolling back the surveillance state and focusing police work on the protection of citizens so that everyone is innocent until proven guilty, rather than regarded with suspicion and subject to scrutiny at the drop of a hat. Private individuals may keep tabs on government activities, but it is not the place of government to keep tabs on private individuals who are guilty of no wrong-doing. Public-Private partnership offers the Worst of Both Worlds. The libertarian party is against government being in bed with big business and offering special privileges to powerful interests to shield them from competition from Mum and Dad businesses and the little guy. The responsibility of business in the market place is to focus on serving customers with excellent products and services, not to compete for lucrative government contracts which leads to corruption and corporate cronyism. The responsibility of government in this respect is to protect consumers from fraud and dodgy dealing. Government cannot fulfil that role while it serves the corporations rather than the people. We offer the only Real alternative to the Status Quo. There are marginal parties on the ballot that who would have you believe that they offer a radical platform for change, when in reality The Scottish People have so far only ever been offered a choice between big-government liberals and big-government conservatives. The size of Government has increased under every single Conservative government, including the Thatcher administration – but it increased in respect to military spending and the pampering of big business. On the other side of the coin, the left claim to oppose the concentration of power in the hands of the few but they have never actually done it. Their platform only stands to hand over more control to those wielding power in government in the hope that the leopard may someday change its spots. We are the only party that is advocating handing all the rights and responsibilities which have made our nation so prosperous back over to the people – where it belongs. 7 Comments on "5 Reasons to vote Libertarian in the Leith Walk by-election"
Let’s get moving on this one. September 10th.It will be on us before we know it. Can we have as many volunteers as possible to help out and make an impact. Time to put some effort in people. How would a Scottish libertarian government help to mitigate the problems associated with poverty in this country. The Free Market has increased the material well-being of those in poverty more than any other institution. Poverty worldwide is already well on the decline, in fact for the first time in history we saw the actual number of people in poverty (rather than just the percentage) decline at the end of the last century. Price competition lowers the price of products which increases the standard of living of the poor, and making it easy to start businesses and employ people creates options for people to learn skills on lower rent jobs, then graduate to higher paid positions, or become so skilled they can create their own job. You can redistribute wealth but you can’t redistribute productivity, at the end of the day if you want less poor people then creating opportunities to create a skilled workforce is the only sustainable solution. What you get paid is relative to what you have to offer to an employer or customer. 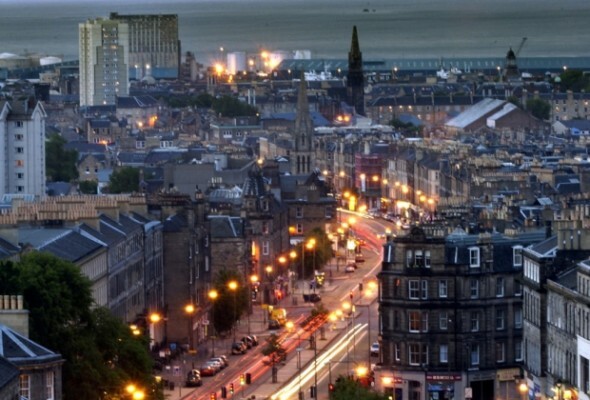 Good points – and a nice photo of Leith. Good luck, Tom. Thanks for taking the time to drop by John. Guys there will be Hustings in St. Mary’s church Broughton Edinburgh on Thursday 27th Aug at 19:15 hrs. Get along and support your Libertarian candidate. Just been included into Electoral Register so will be able to offer one vote for promoting freedom of individual in Edinburgh. What had happened that origin country of Adam Smith drifted away from his values so far. Let’s get it changed. and welcome to Scottish Libertarians.